By the time John Lennon and Yoko Ono got married, it was common knowledge that the pairing could make for some difficult listening. If Sgt. Pepper's Lonely Hearts Club Band was seen as a brilliant step in an experimental direction for the Beatles, The White Album's "Revolution #9" was a jump off a cliff. Largely credited to Lennon and Ono, "Revolution #9" was pastiche as music, as much a dare as it was a piece of songcraft. Lennon and Ono delighted in challenging the boundaries of what people would buy and listen to. Still, "Revolution #9" was small potatoes compared to what Lennon and Ono would do without the weight of the Beatles' name holding them back. Lennon and Ono first lashed out with two albums that existed under the heading Unfinished Music, both of which offer the sounds of everyday life and improvised reactions to it. Perhaps the closest thing to "music" either of those albums approached was the pairing of Unfinished Music No. 2: Life With the Lions' "Baby's Heartbeat" with "Two Minutes Silence", a document of miscarriage that is utterly raw in its matter-of-factness; first, a baby's heartbeat, next, nothing. 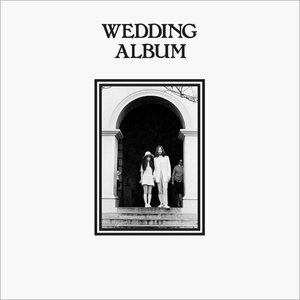 Wedding Album is the third album in Lennon and Ono's trio of experiments, released not even a year after the first -- that year was also the year Abbey Road was being recorded, which perhaps offers some context as to what exactly Lennon was reacting to on a musical level. This new reissue loses the bonus tracks from the Rykodisc CD version, a feature that had become Rykodisc's calling card (see the still sought-after Rykodisc versions of David Bowie's catalog) and presents the album as it existed in 1969: two tracks, one called "John & Yoko", the other called "Amsterdam", each one lasting over 20 minutes and taking up an entire side of the LP. "John & Yoko" revisits the recording of heartbeats, this time the heartbeats of Lennon and Ono themselves. As the heartbeats flutter in and out of sync, Lennon and Ono say "Yoko" and "John", respectively, over and over again, for nearly 23 minutes. That's it! That's the whole side. What separates "John & Yoko" from the pair's previous experiments is that it exists unequivocally as an intentional, constructed art piece, which is perhaps more than can be said for the majority of the Unfinished Music recordings. Past that, it pushes the artist/consumer relationship to a level of intimacy that is both extremely rare and wildly uncomfortable. They shout each other's names; they whisper each other's names. Their voices growl, purr, moan, and converse. Ono and Lennon are sexual at some turns and violent at others, switching between the two in a way that leaves interpretation open, if difficult, for the listener. Sometimes it sounds like they are calling each other's names through tears; other times, there is pure and absolute joy. Behind it all are the sounds of those heartbeats, phasing in and out with each other like some kind of Steve Reich experiment, somehow heightening the closeness the listener feels. It is a brilliantly disquieting composition, and almost impossible to listen to for the full 22-plus minutes. It is a display piece, something that lies inconspicuously on a shelf until someone comes along to show it to. "Check this out, this is wild," you might say, regretting your decision to share this piece of your record collection by the second or third "Yoooookooooooooo". On the flip side is "Amsterdam", closer to Unfinished Music in spirit, but still offering its own vision. "Amsterdam" is pastiche for peace, assembled from recordings that took place during Lennon and Ono's famous wedding celebration and bed-in-for-peace event in a hotel in Amsterdam. The first five minutes or so are of Ono singing "John, John, let's hope for peace" with a little "help" from Lennon, and after that it's all interviews, ambient sounds, and tiny snippets of songs (a bit of "Good Night" here, a little something involving "bed peace / hair peace" there). At one point Lennon orders brown toast from room service. It is maybe not as interesting as "John & Yoko" in terms of the artistic merits, but it is by all means easier to listen to. The reissue also includes a re-creation of the packaging of the 1969 edition of the album, complete with a facsimile of the pair's marriage certificate and a picture of a very ornate piece of cake on a lace doily. The story, of course, was that this was Lennon and Ono's way of bringing whoever wanted to be a part of their new marriage in to celebrate with them. In that way, the presence of "John & Yoko" makes sense; as an expression of love, anger, and conversation, it is timeless and uncompromising. It offers an openness that is usually reserved only for close friends and family (and some of it would make even the closest of family squirm). "Amsterdam" also makes sense, as the aural equivalent of the home video highlights of the honeymoon. Nobody will listen to either very often, but for a certain subset of a devoted fandom, the point isn't listening to it, the point is merely owning it. Secretly Canadian is doing an unsurprisingly excellent job of bringing it back in the most complete and faithful-to-the-original way possible; if all of this adds up to something that sounds appealing to you, well, you're not likely to be disappointed.